The Trophy was designed by the architect S. J. Nicholl and constructed by Cox & Sons. Specifically designed for the Challenge Cup Competition, the trophy was made of gold and silver. For the information of our readers we may state that the prize is a magnificent vase, standing three feet high, and consisting entirely of gold and silver, and pearls from a design by Mr. Nicholl. It has Lewi executed by Messrs. Cox, an eminent London firm, and the superior finish of this handsome work of art is the theme of general admiration. In form it is square, and at the base is a richly ornamented enclosure. From the centre of this square ascends the spire or dome adorned with carved designs representing King David, and some of the great masters in music. It is also enriched with four pearls of the value of fifteen guineas, each. 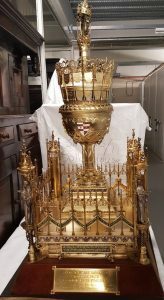 Near the summit stands the cup, and beneath, the dome is surrounded by a circle of tablets, upon which will be inscribed in rotation the names of the successful Choral Societies, which will be fortunate in carrying off this great trophy. No written description can convey an adequate idea of its excellence, and as it will shortly be exhibited in the various towns of South Wales.